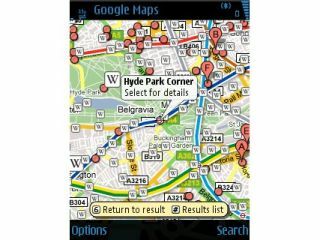 Google's relentless charge towards packing everything on the 'net into a mobile has moved a step further with 'Layers' in Google Mobile maps providing a new level of information. This means you can overlay the map you're looking at with things like public transport information, interesting (and obviously factually accurate) Wikipedia information, and traffic incident information. Latitude is also more tightly integrated as well, as well as local search results all combined in your own formation. There are many more search results to look at in the new service, as well simultaneous searches running at once, should you need to know lots of bits and pieces about the new place you're lost in at once. To activate the service when Google Maps-ing around town, simply enable it in the menu options, or press the '2' key to make life that little bit easier. The new upgrade is available now on Symbian S60 and Windows Mobile phones, and will come soon to other platforms.